Ralph Baer working on a Brown Box reproduction in 2010. Ralph Henry Baer (born Rudolf Heinrich Baer; March 8, 1922 – December 6, 2014) was a German inventor, game developer, and engineer. Baer's family had fled Germany just before World War II and Baer served the American war effort, following which he gained an interest in electronics. Through several jobs in the electronics industry, he was working as an engineer at now BAE Systems, when he conceived of the idea of playing games on a television screen around 1966. With support of his employers, he worked through several prototypes until he arrived at a "Brown Box" that became the blueprint for the first home video game console, the Magnavox Odyssey. Baer continued to design several other consoles and computer game units, including contributing to design of the Simon electronic game. Baer continued to work in electronics until his death in 2014, with over 150 patents to his name. Baer is considered "the Father of Video Games" due to his many contributions to games and the video game industry in the latter half of the 20th century. In February, 2006, he was awarded the National Medal of Technology for "his groundbreaking and pioneering creation, development and commercialization of interactive video games, which spawned related uses, applications, and mega-industries in both the entertainment and education realms". Baer was born in 1922 to Lotte (Kirschbaum) and Leo Baer, a Jewish family living in Germany, and was originally named Rudolf Heinrich Baer. At age 14, he was expelled from school because of his ancestry and had to go to an all-Jewish school. His father worked in a shoe factory in Pirmasens at the time. Baer's family, fearing increasing persecution, moved from Germany to New York City in 1938 two months prior to Kristallnacht while Baer was a teenager. Baer would later become a naturalized United States citizen. In the United States, he was self-taught and worked in a factory for a weekly wage of twelve dollars; upon seeing an advertisement at a bus station for education in the budding electronics field, he quit his job to study in the field. He graduated from the National Radio Institute as a radio service technician in 1940. In 1943 he was drafted to fight in World War II and assigned to military intelligence at the United States Army headquarters in London. With his secondary education funded by the G.I. Bill, Baer graduated with a Bachelor of Science degree in Television Engineering (unique at the time) from the American Television Institute of Technology in Chicago in 1949. In 1949, Baer went to work as chief engineer for a small electro-medical equipment firm, Wappler, Inc., where he designed and built surgical cutting machines, epilators, and low frequency pulse generating muscle-toning equipment. In 1951, Baer went to work as a senior engineer for Loral Electronics in Bronx, New York, where he designed power line carrier signaling equipment for IBM. From 1952 to 1956, he worked at Transitron, Inc., in New York City as a chief engineer and later as vice president. He started his own company before joining defense contractor Sanders Associates in Nashua, New Hampshire (now part of BAE Systems Inc.) in 1956, where he stayed until retiring in 1987. Baer's primary responsibility at Sanders was overseeing about 500 engineers in the development of electronic systems for military applications. However, out of this work came the concept of a home video game console; he would go on to create the basis for the first commercial units, among several other patented advances in video games and electronic toys. As he approached retirement, Baer partnered with Bob Pelovitz of Acsiom, LLC, and they invented and marketed toy and game ideas from 1983 until Baer's death. Baer was a Life Senior Member of Institute of Electrical and Electronics Engineers. His son, Mark, helped lead the nomination process to elevate him to become an IEEE Life Fellow, the highest level of membership within the organization. Baer married Dena Whinston in 1952; she died in 2006. They had three children during their marriage, and at the time of Baer's death, he had four grandchildren. Baer died at his home in Manchester, New Hampshire on December 6, 2014, according to family and friends close to him. Baer is considered to have been the inventor of video games, specifically of the concept of the home video game console. In 1966, while an employee at Sanders Associates, Baer started to explore the possibility of playing games on television screens. He first got the idea while working at Loral in 1951, another electronics company, however, they wanted nothing to do with it at the time. In a 2007 interview, Baer said that he recognized that the price reduction of owning a television set at the time had opened a large potential market for other applications, considering that various military groups had identified ways of using television for their purposes. Upon coming up with the idea of creating a game using the television screen, he wrote a four-page proposal with which he was able to convince one of his supervisors to allow him to proceed. He was given US$2,500 and the time of two other engineers, Bill Harrison and Bill Rusch. They developed the "Brown Box" console video game system, so named because of the brown tape in which they wrapped the units to simulate wood veneer. Baer recounted that in an early meeting with a patent examiner and his attorney to patent one of the prototypes, he had set up the prototype on a television in the examiner's office and "within 15 minutes, every examiner on the floor of that building was in that office wanting to play the game". The Brown Box was ultimately patented on April 17, 1973, given U.S. Patent No. 3728480, and became jointly owned by Ralph Baer and BAE Systems. Baer began seeking a buyer for the system, turning to various television manufacturers who did not see interest in the unit. In 1971, it was licensed to Magnavox, and after being renamed Magnavox Odyssey, the console was released to the public in May 1972. For a time it was Sanders' most profitable line, selling over 340,000 units, though many in the company looked down on game development. Baer is credited for creating the first light gun and game for home television use, sold grouped with a game expansion pack for the Odyssey, and collectively known as the Shooting Gallery. The light gun itself was the first peripheral for a video game console. The success of the Odyssey led to competition from other companies, in particular Atari, Inc., led by Nolan Bushnell at the time. Bushnell saw Baer's successful devices and was able to create the first arcade machine in 1972 based on Baer's Table Tennis idea, resulting in Pong. The success was very limited though, due to the high price and confusing advertising. Sanders and Magnavox successfully sued Atari for patent infringement over Baer's original ideas, but Bushnell would continue to push Atari forward to become a leader in both home and arcade video games. This led to a lengthy conflict between Baer and Bushnell over who was the true "father of video games"; Baer was willing to concede this to Bushnell, though noted that Bushnell "has been telling the same nonsensical stories for 40 years". Baer would help both Magnavox and later Coleco to develop competitive units to Atari's products, including the Odyssey 100 and the Odyssey2. Ultimately, the industry came to name Baer as the father of the home video game console, while crediting Bushnell with creating the concept of the arcade machine; Upon Baer's death, Bushnell stated that Baer's "contributions to the rise of videogames should not be forgotten". Baer is also credited with co-developing three popular electronic games. Baer, along with Howard J. Morrison, developed Simon (1978) and its sequel Super Simon (1979) for Milton Bradley, electronic pattern-matching games that were immensely popular through the late 1990s. The US patent for Simon, Pat No. 4,207,087 was obtained in 1980 by patent counsel for Marvin Glass and Associates, Robert J. Schneider, a managing partner with the firm of Mason, Kolehmainen, Rathburn and Wyss. Schneider is currently Co-Chair of the Intellectual Property Department of Taft, Stettinius & Hollister LLP. Baer also developed a similar pattern-matching game "Maniac" for the Ideal Toy Company (1979) on his own, though the game was not as popular as Simon; Baer considered that Maniac was "really hard to play" and thus not as popular as his earlier game. In 2006, Baer donated hardware prototypes and documents to the Smithsonian Institution. He continued to tinker in electronics after the death of his wife through at least 2013. By the time of his death, Baer had over 150 patents in his name; in addition to those related to video games, he had patents for electronic greeting cards and for tracking systems for submarines. In addition to being considered "The Father of Video Games", Baer was recognized as a pioneer in the video game field. His accolades include the G-Phoria Legend Award (2005), the IEEE Masaru Ibuka Consumer Electronics Award (2008), the Game Developers Conference Developers Choice "Pioneer" award (2008), and the IEEE Edison Medal (2014). Baer was posthumously given the Pioneer Award by the Academy of Interactive Arts and Sciences at the 2015 Game Developers Conference. On February 13, 2006, Baer was awarded the National Medal of Technology by President George W. Bush in honor of his "groundbreaking and pioneering creation, development and commercialization of interactive video games". On April 1, 2010, Baer was inducted into the National Inventors Hall of Fame at a ceremony at the United States Department of Commerce in Washington, D.C.
^ a b Hatfield, Daemon (December 20, 2007). "GDC 2008: Ralph Baer Receiving Pioneer Award". ign.com. Retrieved December 7, 2014. ^ "The National Medal of Technology and Innovation 2004 Laureates". 2004. Retrieved December 7, 2014. ^ "Ralph H. Baer". Union Leader. ^ O'Dea, Meghan. "Ralph Baer." In Immigrant Entrepreneurship: German-American Business Biographies, 1720 to the Present, vol. 5, edited by R. Daniel Wadhwani. German Historical Institute. Last modified April 28, 2016. ^ Plunkett, Luke (May 3, 2011). "The Father Of Video Games Fled The Nazis, Fought Them Then Took All Their Guns". Kotaku. Gawker Media. Retrieved December 7, 2014. ^ Karras, Steve (October 19, 2012). "Ralph Baer: The Father of the Video Game". The Huffington Post. Retrieved December 7, 2014. ^ Edwards, Benj (March 23, 2007). "The Right to Baer Games – An Interview with Ralph Baer, the Father of Video Games". Gamasutra. Retrieved December 7, 2014. ^ "Icons: Ralph Baer". Icons. Season 4. Episode 5006. June 9, 2005. G4. ^ Dillon, Roberto (2011). The Golden Age of Video Games: The Birth of a Multi-billion Dollar Industry. Taylor & Francis Group. ISBN 978-1-4398-7323-6. ^ Wolf, Mark J.P. (2001). The Medium of the Video Game. University of Texas Press. ISBN 0-292-79148-8. ^ Kent, Steven (2001). Ultimate History of Video Games. Random House. ISBN 978-0-7615-3643-7. ^ Loh, Jules (February 6, 1977). "Inventor Has Deep Impact on U.S. Life". Eugene Register-Guard. Retrieved December 7, 2014. ^ a b c d e f g h Marino-Nachison, David (December 7, 2014). "Ralph H. Baer, a father of video gaming, dies at 92". The Washington Post. Retrieved December 7, 2014. ^ a b c Burrowes, Declan (July 13, 2013). "Baer's Odyssey: Meet the serial inventor who built the world's first game console". Ars Technica. Retrieved December 7, 2014. ^ Cf. Wolverton, Mark, "The Father of Video Games", American Heritage Invention and Technology magazine, Fall 2009 issue. ^ American Television Institute, earlytelevision.org; accessed December 7, 2014. ^ a b Smithsonian Institution, "Administrative/biographical history", Ralph H. Baer Papers, The Jerome and Dorothy Lemelson Center for the Study of Invention and Innovation; smithsonian.org; accessed December 7, 2014. ^ a b c Martin, Douglas (December 7, 2014). "Ralph H. Baer, Inventor of First System for Home Video Games, Is Dead at 92". The New York Times. Retrieved December 7, 2014. ^ Stephen Kline; Nick Dyer-Witheford; Greig De Peuter (2003). Digital Play: The Interaction of Technology, Culture, and Marketing. McGill-Queen's University Press. ISBN 0-7735-2591-2. ^ Sheffield, Brandon (June 23, 2008). "Paris GDC: Baer On The Industry's Birth, Preserving History". Gamasutra. Retrieved December 7, 2014. ^ "NEWSLETTER: A House Journal of IEEE Kerala Section". April–June 2006. Archived from the original on August 21, 2009. Retrieved April 17, 2007. ^ Pretz, Kathy (November 25, 2014). "Son's Quest to Get Father of Video Games Elevated to IEEE Fellow". Institute of Electrical and Electronics Engineers. Retrieved December 7, 2014. ^ Graft, Kris (December 7, 2014). "Ralph Baer, 'father of video games', passes away". Gamasutra. Retrieved December 7, 2014. ^ a b Griffiths, Devin (2013). Virtual Ascendance: Video Games and the Remaking of Reality. Lanham, MD: Rowman and Littlefield Publishers. ^ "Meet the video games godfather: Ralph Baer". The Guardian. Retrieved December 13, 2015. ^ a b c "The Father of the Video Game: The Ralph Baer Prototypes and Electronic Games". Smithsonian Institution. Retrieved December 7, 2014. ^ Horiuchi, Vince (November 7, 2011). "Ralph Baer, the Father of Video Games, reflects on his career". The Salt Lake Tribune. Retrieved December 7, 2014. ^ Barton, Mat; Loguidice, Bill (January 9, 2009). "The History Of Pong: Avoid Missing Game to Start Industry". Gamasutra. Retrieved December 8, 2014. ^ Vendel, Curt; Goldberg, Marty (2012). Atari Inc.: Business Is Fun. Syzygy Press. p. 26. ISBN 0985597402. ^ Clark, Don (December 8, 2014). "Ralph Baer, a Pioneer of Videogames, Is Remembered". The Wall Street Journal. Retrieved December 8, 2014. ^ "Ralph Baer game designs". Retrieved October 12, 2012. ^ Tim Walsh (2005). Timeless Toys: Classic Toys and the Playmakers Who Created Them. Andrews McMeel Publishing. ISBN 0-7407-5571-4. ^ "Maniac Electronic Game, 1979". Smithsonian Institution. Retrieved December 7, 2014. ^ David Friedman (photographer) (2013-03-07). Video Games | INVENTORS | PBS Digital Studios — Ralph Baer. PBS. Retrieved 2014-12-07. ^ Plunkett, Luke (December 7, 2014). "The Father Of Video Games, Ralph Baer, Has Passed Away". Kotaku. Retrieved December 7, 2014. ^ Sheffield, Brandon (July 28, 2005). "Wrap-Up: G4's G-Phoria Video Game Awards". Gamasutra. Retrieved April 18, 2007. ^ "IEEE Masaru Ibuka Consumer Electronics Award Recipients". IEEE. Retrieved May 2, 2008. ^ "Recipients of the 2014 Medals and Awards". Institute of Electrical and Electronics Engineers. February 14, 2014. Archived from the original on February 24, 2014. Retrieved April 24, 2014. ^ Cork, Jeff (January 9, 2015). "Ralph Baer, Al Alcorn To Receive AIAS Pioneer Awards". Game Informer. Retrieved January 9, 2015. ^ Crecente, Brian (February 6, 2015). "Game industry pauses to say thanks to the father of gaming". Polygon. Retrieved February 6, 2015. ^ "President George W. Bush Presents…". White House Archives. February 2006. Retrieved December 7, 2014. ^ Carless, Simon (November 17, 2005). 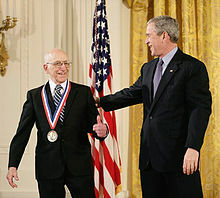 "Game Pioneer Ralph Baer Wins National Medal". Gamasutra. Retrieved December 7, 2014. ^ Brooks, David (April 7, 2010). "N.H. brain behind GPS in hall of fame". The Telegraph. Archived from the original on July 14, 2014. Retrieved December 7, 2014. Baer, Ralph (2005). Videogames: In The Beginning. Rolenta Press. ISBN 0-9643848-1-7. Herman, Leonard (2001). Phoenix: The Fall & Rise of Videogames. Rolenta Press. ISBN 0-9643848-5-X. Wolverton, Mark, "The Father of Video Games: From a few notes scribbled on a notepad, Ralph Baer invented a new industry", American Heritage Invention and Technology magazine, Fall 2009. Wikimedia Commons has media related to Ralph Baer. Ralph H. Baer Papers, 1943–1953, 1966–1972, 2006 – Ralph Baer's prototypes and documentation housed at the Smithsonian Lemelson Center. Ralph H. Baer profile at The Escapist magazine. "The Right to Baer Games – An Interview with Ralph Baer, the Father of Video Games" – From GamaSutra and the March 2007 edition of Game Developer magazine.